In this month’s Teacher’s Corner, we’ll discuss how to incorporate STEM (Science, Technology, Engineering, and Mathematics) content into your English language classroom. Across the world, there has been a growing interest in Science, Technology, Engineering, and Math (STEM) education. Much of this interest comes from the growing daily use of technology; from computers to cell phones to driverless cars, more and more of the world is powered by computer code. The largest companies in the world are increasingly technology-based and in need of skilled engineers, computer coders, and scientists. Incorporating STEM subject matter into our English language classrooms can help our students develop awareness and skills that may help them in their future careers. In fact, many educators are now arguing for STEAM education: Science, Technology, Engineering, Art, and Math. The call for adding art education to STEM learning comes from the need to effectively communicate creatively in the areas of science, technology, engineering, and math through excellent speaking and writing skills. During Week 1, we’ll begin the month with a reading and speaking activity centered on reducing, reusing, and recycling to protect the environment. In Week 2, students will engage in listening and reading while learning about coding. In Week 3, students will be encouraged to explore the role women have played in engineering and computer science through a reading and writing activity. Finally, in Week 4, we’ll conclude with a reading and speaking activity centered on solving a logic puzzle. For more on STEM, check out the American English STEM MOOC! Part of the growing interest in Science, Technology, Engineering, and Math (STEM) education has been the push to make science and math more interesting and hands-on for students. Teachers are increasingly looking for ways to change the teaching of science and math from rules and formulas to problem solving and critical thinking. In this week’s Teacher’s Corner, we will take a fun and creative approach to science by encouraging students to think of problems in their own environment and to create solutions. Note: This activity involves students creating videos. This can be done on most mobile phones. If video recording is not possible, the project can be done with an audio recording. If mobile phones or other recording devices are not available, students can create environmental reports on paper. Print out copies of Appendix 1. This activity occurs across several days and includes the following activities: a homework assignment, a classroom activity about the environment, and an environmental field report. For the environmental field report, students are tasked with visiting a local area where an environmental issue occurs. If this is not possible for the students, they can still create a video where they discuss a local issue without visiting the site. In this part of the activity, students will read Chapter 4 of Trace Effects. In this chapter, the characters work to clean up an area near the Grand Canyon in the United States. 1. Begin this activity at the end of the class session the day before the class session in which Activity Part Two takes place. 2. Students should read Chapter 4 of Trace Effects for homework. a. Note: If you are new to Trace Effects and the storyline of Chapter 4, see the Trace Effects Teacher’s Manual Chapter 4 for more information. b. An alternative to assigning the reading of this chapter as homework would be to have students read it together in class. This may be more suitable for lower-level learners. 2. Next, have the students form pairs or small groups. Each group will need one sheet of paper and a pen or pencil. 3. In their groups, have the students list the three places that George and Trace visit and work to clean up. 5. Next, give each pair or small group a copy of the Reduce, Reuse, and Recycle worksheet in Appendix 1. 6. Challenge the groups to brainstorm as many ideas as possible about how to reuse the three items George and Trace found: plastic bottles, plastic bags, and newspapers. Set a timer depending on the level of your students or the time remaining in class. 7. Once time is up, have the groups share their ideas with the class. The groups can vote on the best ideas, or the pair or small group with the most ideas can be made the winner. 8. For homework, assign Activity Part Three to the class. For Activity Three, students will work in groups to create short videos to identify a local environmental issue and to present ways to help solve the problem. 1. As homework, each group of students will select a location in the local area that could benefit from environmental clean-up. 2. Student groups will coordinate to visit that area. 3. At the location, have the students record a short video to show the location and describe the environmental issues there. 4. After showing the location and describing the environmental issue, have the students record themselves explaining how the location could be cleaned up and improved. a. What items in the area can be recycled? b. Can any of the items in the area be reused? How? c. What else can be done to improve and clean up this area? 5. In the next class, have students share their videos with the class. Optional activity: If possible, after the class has watched all the videos, have them pick one of the locations and organize a clean-up day! Directions: For each of the items on the left brainstorm ways to reduce using them, ways to reuse them, or what could be made if they were recycled. Directions: For each of the items on the left, brainstorm ways to reduce using them, ways to reuse them, or what could be made if they were recycled. According to the website Code.org, in the United States alone there are more than half a million coding jobs available. The reason is that few students are learning to code, but the demand for this skill is only increasing. As technology continues to grow, more jobs will require coding skills. In this week’s Teacher’s Corner, we will explore the technology component of STEM (Science, Technology, Engineering, and Math) by learning the basics of coding. Along the way, students will practice their listening and reading skills by coding in an English-only environment. This week’s activity takes a constructivist approach to teaching and learning. In constructivism, students are encouraged to work through problems and discover answers. This style of learning requires teachers to take a less direct role in the classroom. Instead of directing students and telling them what to do, teachers support students in their learning. In this week’s activity, students should know that mistakes are part of the learning process. Our goal as teachers will be to encourage them to think through the problems and to keep trying – not provide answers to them. For more on constructivism, check out Constructivism in Theory and in Practice. This activity uses the websites Code.org and Scratch. Before using this activity in class, visit the websites to become familiar with them. If you are new to coding, try some of the basics yourself! This activity begins with an “Hour of Code” on the Code.org website. The Hour of Code allows students to practice the basics of coding with videos and tutorials that guide them through the process. After they have completed their hour of code, students can print out a certificate of completion. Begin the class by having students go to a computer. Students can work individually or in small groups. On the whiteboard/chalkboard write down the website Code.org and have the students navigate to that webpage. Note: The “Students” area is to the lower left of the screen and colored in purple. Students may need to scroll down the page to see the student area. On the student page, have the students click on the Hour of Code start button. Note: The Hour of Code option is the second option on the screen. Once the students are on the Hour of Code page, they can choose which Hour of Code they would like to do. The webpage offers a variety of options from famous characters to famous video games, but they all teach the same content. After the students have selected their Hour of Code, have them begin the activity. Each activity begins with a short video that students should watch. After watching the video, students should follow the on-screen directions to begin building their code. Have the students work on their code for as long as time permits. Students who do not finish their code in class can work on it after class as a homework assignment. If time permits at the end of class, have the students share what they did and what they learned by presenting their work to the class for an optional speaking activity. Note: On the first day of incorporating this activity in your classroom, you may wish to walk students through the process and conduct this as a whole-class learning experience and demonstration. You could display your own computer and have all students choose the same activity in order to become familiar with it. This second activity can be completed as an extension of the first activity or as a stand-alone activity. On the whiteboard/chalkboard write down the website scratch.mit.edu and have the students navigate to the Scratch webpage. On the Try It Out page, have the students click on the “Getting Started with Scratch” section of the website on the right side of the webpage. Note: To begin the tutorial, have the students click on the blue ”Start Moving” button. 5. Have students follow the tutorial while they create a small project on Scratch. a. For students who already know code or who are eager to learn more, encourage them to explore the Scratch webpage. Scratch is less structured than Code.org, but it allows students to make more complex projects. Note: As mentioned for the first activity, you may wish to walk students through the process and conduct this as a whole-class learning experience and demonstration on the first day. You could display your own computer screen and have all students work as a whole class on the first project before they work in independent groups. In this week’s Teacher’s Corner, students learn about the work of women in engineering and math. Encouraging more girls and young women to join these professions begins in the classroom by challenging negative stereotypes of the role of women in science. Reading, speaking (primary focus); listening (secondary focus). Print out copies of “From Computers to Leaders: Women in Science” in Appendix 1. Print one copy for each student in the class. 1. Begin the activity by giving each student a copy of the reading “From Computers to Leaders: Women in Science” in Appendix 1. 2. Have the students read the information on their own for 2-3 minutes. As students read, encourage them to be active readers by underlining or circling any words or ideas they do not understand. d. What is the most interesting information you learned in the reading? 4. After checking the students’ understanding, have them form pairs. 5. Next, have the pairs write down each of the words in bold from the reading and write a definition for each of the words. Encourage the students to use the context of the reading to write the definitions of the words. 6. After the pairs have written their definitions, have them join with another pair. In this larger group, have them compare their definitions to see how similar or different they are. 7. Review the definitions of the words as a class. a. Note: The definitions in Appendix 2: Reading Activity Definitions should be taken as guidelines since students’ definitions may vary in wording depending on their level. 8. Finish this part of the activity by having students write sentences using the word they just defined. Have the students work in their pairs to write new sentences about the reading using these new words. Make sure to remind students that they can use the sentences from the reading to help them, but that they must write their own original sentences to show that they understand well. 9. For extra speaking practice, have the pairs share their new sentences with the class. a. Do you know any engineers? What can you tell us about their jobs? b. Would you like to be an engineer like Katherine Johnson and Limor Fried? 2. Have the students list the types of careers that are possible by studying engineering and math. a. What skills are necessary for engineers? b. How can each of us develop our skills in this area? c. In our community, do we typically see men in this career or women? Why do we think that is the case? d. What do you think could be done so that more women and men pursue careers in this field? 4. As a class, discuss students’ answers to these questions. 5. Finally, have the pairs take out a clean sheet of paper. a. Note: If possible, provide the pairs with large sheets of poster paper. 6. Have the students choose one of the ideas they brainstormed and draw a picture representing it on the sheet of paper. a. For example students could draw posters of women working in laboratories, programming computers, or as astronauts on the moon! 7. Once all the pairs have created their poster, have them share their posters with the class for additional speaking practice. For more information on bringing engineering into the English classroom, check out Teaching English for Science and Technology: An Approach for Reading with Engineering English. For more on women in the sciences, check out Grace Hopper and the First Computer Language. Finally, for more on critical reading in the classroom, check out Encouraging Critical Reading in the EFL Classroom. Directions: Read the information below. After reading the information, work with a partner to define the words highlighted in bold. When we think of computers, we think of machines. However, the word computer means something that calculates. In the past the word computer was used as a name for people who did math, often using pen and paper. Many of these people were women. One of the most important early computers was Katherine Johnson. Johnson worked for the National Aeronautics and Space Administration, or NASA, where she calculated spacecraft flight paths. At first she was kept from doing engineering work because many people believed that women could not do scientific work. When some people at NASA saw her talents in math and physics, they asked her to help the flight teams preparing to send astronauts to space. In fact the first American in space, Alan Shepard, said he would not travel to space until Johnson had checked the math calculations. Katherine Johnson was a pioneering woman working in mathematics and engineering and encouraged opportunities for more women in engineering. A modern example of a woman who does innovative work in math and engineering is Limor Fried. Fried graduated with a degree in electrical engineering from the Massachusetts Institute of Technology. As a student she started her own electronics company where people can buy electronic and computer parts and learn how to build their own digital tools. She creates do-it-yourself, or DIY, projects so that anyone, especially girls and young women, can learn how to create and control technology. While most people today no longer do calculations on pen and paper, they are actively working to create the computers of tomorrow. We will wrap up this month’s Teacher’s Corner on STEM in the classroom with math! While students may think of math as just numbers, thinking mathematically means using logic and reason to solve problems. This week students will play with logic puzzles. These puzzles require critical thinking and logic to solve and are a great way to get students thinking mathematically. Read all of the materials carefully before starting the activity. Read over the logic puzzle in Appendix 1 and the logic puzzle answers in Appendix 2. 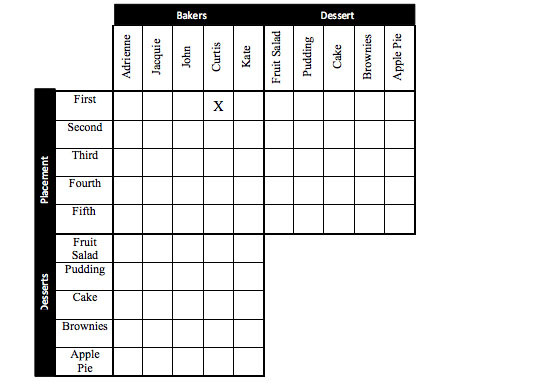 The answer key has the filled-out logic chart that can be shown to students. It also has the “Answers at a Glance” at the bottom of the page to refer to during the activity. Print out enough copies of the logic puzzle in Appendix 1 for each student. Copies of the answer key in Appendix 2 can also be printed for each student, or the answers can be listed on the chalkboard/whiteboard. Logic puzzles can be challenging for students. If students are struggling to fill in the chart, encourage them to think carefully. 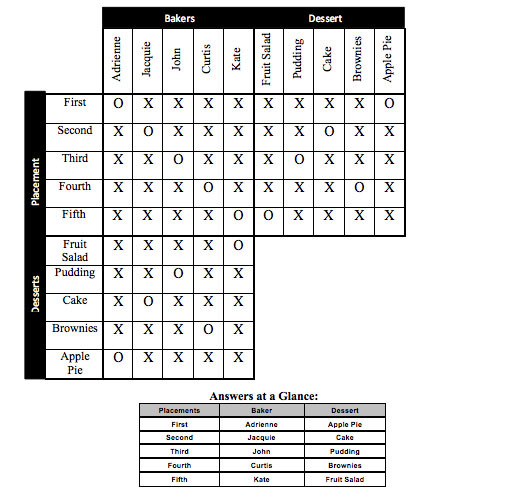 In logic puzzles, there are no trick questions or hidden answers; all the information needed to fill in the chart is provided in the clues. Students may need to compare clues or use information in one clue to solve another clue. 1. Begin the activity by having students form pairs or small groups of 2-3 students each. 2. Give each pair or small group of students a copy of the logic puzzle in Appendix 1, and read through the directions together. a. Note: Depending on the level of your students, review the logic puzzle vocabulary with the class. Each of the items listed is a common type of American dessert. 3. Have the groups work through the logic puzzle. 4. Encourage the groups to take out a separate sheet of paper to write down notes as they work through the puzzle. 5. After all the groups have completed the logic puzzle, compare answers as a class. If students enjoyed working on the logic puzzles, encourage them to create their own. The logic puzzle in this activity can be used as a template, and students can create new names and items, then rearrange them and finally write new clues. For more advanced classes, remove the clues from the bottom of the logic puzzle in Appendix 1. Then once the students are in pairs or small groups, give one student the clues and the other student, or students, the logic puzzle. The student with the clues should read them aloud to their partner(s), who will then fill in the puzzle. The student(s) filling in the puzzle may not write down the clues but must use only their listening skills. Directions: Use the clues below to fill in the boxes of the puzzle. Use an X for incorrect information and an O for correct information. As an example, the first clue has been completed for you. 1. Curtis didn't finish first. 2. Jacquie made the cake. 3. The person who entered his pudding, the person who finished first, the person who entered brownies, and the person who finished fifth are all different people. 5. Jacquie finished one place before the baker who entered his pudding. 6. John is either the baker who finished third or the baker who finished first. 7. John finished after the person who entered her apple pie.